Grrr. This made me blow my steam. Imagine, I was in the shower, and felt what could have been a skin tag, or low and behold, an insect, a tick maybe. I am sure my jaw dropped when it was a tick I held between my little fingers. 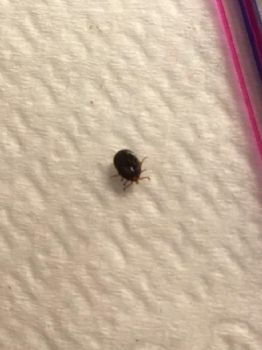 A teeny weeny blood filled tick, who had been sucking and lapping at my lifeblood, the little bloodsucker! I don't have time for this. But, it does let me know a better reason for my headaches. I saw what could have been a bullseye last week, but then blew it off as ring worm. Whatever it was disappeared. 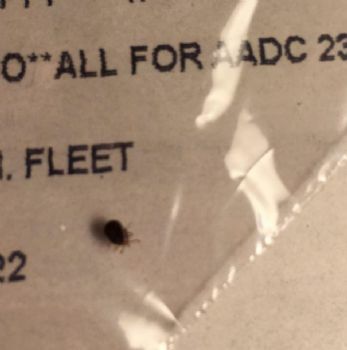 I found this tick in the exact same place. Oh bother. And of course, I had to go to urgent care, another NP, who was focusing on my sinuses and needling sinus meds instead of this bloody tick, literally. I brought her the tick in a little plastic bag, but she wanted nothing to do with it. Last time I went to a doctor, they said to bring the little sucker in. Sigh. Into Deep Six it went. I thought the CDC was keeping track? Doesn't this little bug mean something? I live in a different state now. One where there are other tick borne diseases besides Lyme. This is NOT a wood tick. Note the picture next to the typewritten letters. See how small? 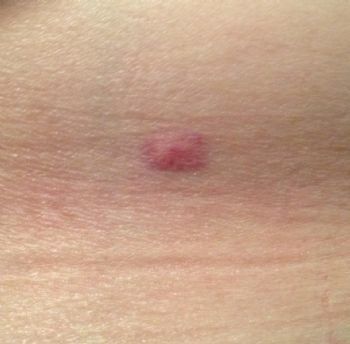 Most probably a deer tick. It certainly seems to match the size spectrum. I HATE bugs with an abhorrence that borders obsession. I hate them nearly as much as I despise snakes. Unfortunately, bugs tend to bug me more frequently. This is what this little buggy left for me. on my waist. So, after I went to physical therapy and wore myself out, I had gone to urgent care. Today I am exhausted. Last night my back hurt, but I did sleep almost 6.5 hours. I am taking it a little more easier today. Right. Huh! As if. So, Getting healthy is my job. Squish the bugs, and let's have at it. So glad that Tick is OFF. I guess I can Tick that one off my list. I like lady bugs though. I am grateful I don't feel any effects from them. Just to be safe maybe you should be checked for Lyme disease? HUGS!